AC Repair Spring Texas and The Woodlands Tx. If your home air conditioning system needs repair then contact the professionals at SWAT AC and Heating Repair to come out and diagnose and fix your HVAC system. 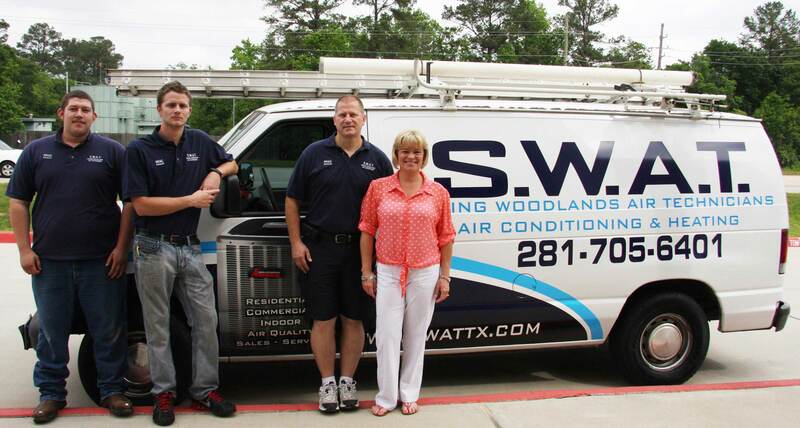 Our team has been serving the local communities for Commercial AC and Residential HVAC maintenance and repairs and installation of new AC and Heating systems for over 29 years now serving the North Houston and Spring areas. We are also master distributors of Global Plasma Air Purifier systems for total home air quality. If you want to control your heating and or air conditioning system from a remote location, we can also install ecobee smart thermostat systems. Find affordable air-conditioning products and services at Spring Woodlands Air Technicians. We provide repair, preventative maintenance, tune-ups, and real estate inspections for buyers and sellers. Most smart thermostats only read the temperature in one place (usually the hallway) which can make other rooms uncomfortable. ecobee4 comes with a room sensor to help manage hot and cold spots. Sun Screens – We offer custom solar screens that can keep glare and heat into your home at a minimum and make your AC systems work more efficiently! Manitowoc Ice has an entire line ofundercounter ice machines to match your restaurantneeds. Learn more about our NEO, Sotto, and Big Shot Ice Machines. We are a family run business and believe in family values. We will treat you like you are part of our family and make sure that you are taken care of like we would take care of grandma! Call us and experience the best service you have ever had! Junior as we call him, has been with SWAT for over 7 years and is well versed in all phases of installation and repair work on all AC and Heating systems. Todd and Stacy are the owners of SWAT. Todd is the primary technical person and the founder of the company. Stacy keeps the books in order and makes sure you are happy! Brandon is our go to guy for anyting heat related. He can work on AC systems as well. All of our technicians are fully trained from the factory and well versed in all HVAC areas! Spring, Champions, Conroe, Cypress, Cypersswood, Tomball, The Woodlands and All Points in between. Spring Woodlands Air Technicians specializes in Residential AC and Heating Repair and replacement. SWAT is a national representative of Global Plasma Whole Home Air Purification Systems. SWAT is an Ecobee preferred contractor for the entire Ecobee line including smart thermostats for home and business solutions. SWAT is s fully qualified commercial HVAC contractor and can proviode full scale commercial heating and air conditioning systems repair, and replacement.